The Music Box is a story of two men: Maelzel the greedy inventor and Beethoven the famous composer. It is also the story of magical musical inventions and a beautiful clockwork Ballerina. 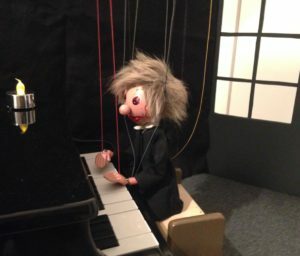 Through music, narration, puppetry and images in a theatre box, we create a world of wonder and curiosity where our young audiences experience compositions by monumental composers arranged for string quartet and toy piano.